It was our first time to go to my province in Romblon using 2GO Travel (St. Ignatius of Loyola) last month. The truth is, we've been using plane to visit Tablas island for a while until the operation stopped to make way for the expansion of Tablas Airport. Nonetheless, one major reason that we opted traveling by plane for the longest time was the size of the boats servicing Odiongan Port and the weather during our previous travels. Besides, going to places with a preschooler and a newborn baby is challenging enough. So, to lessen the stress, I bought cabin tickets and prayed for the best. Here's our experience. A cabin ticket with 2GO Travel from Batangas Port to Odiongan Port is P1264. Each cabin has 2 to 3 bunk beds, occupying 4 to 6 people. Each bed is covered with thick curtains and provided with clean sheet, pillow and blanket. Inside a 2GO Travel cabin, aside from bunk beds, are TV with cable, small table, and ottoman chair, cabinets with lifejackets and extra space for passenger's luggages. The cabin toilet with sink and shower is clean and provided with tissue paper. A cabin ticket includes a single meal with choices of chicken, pork and beef dishes. As you can see in the photo, my elder daughter enjoys watching TV while having dinner. Her plate has rice, fried chicken and buttered mixed veggies. Drinks are not included in each meal though. If ever we need to travel back to province and still no plane flights to Tablas, I guess we'll use 2GO Travel again. I like the fact that the ship leaves early from Odiongan at 11 o'clock in the morning so we are back to Manila by 10 PM. Add to that, is the guaranteed smooth sailing of the vessel, not too shaky like other smaller boats. 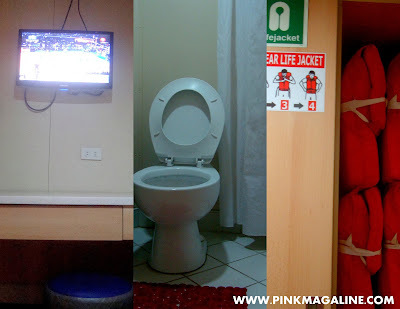 Aside from cabin, they also have state room, tourist, and super value accommodation. You got a cute curly daughter... la lang..